Tuzigoot National Monument is located east of Clarkdale, Arizona. In the language of the Western Apache, it sounds like the word “Tu Digiz” and means winding water. The monument represents the ruins of the ancient Pueblo, who built their homes on sand and limestone formations. They are above the Verde River and represent one hundred and ten rooms. They are built by the Sinagua between the 1125th and 1400 year BC. Tuzigoot are among the best preserved ruins of the Sinagua in the Verde Valley. The land that surrounds the monument was owned by the company United Verde, which had sold Yavapai County for one dollar in order to continue excavations. Yavapai County donated the land to the federal government. 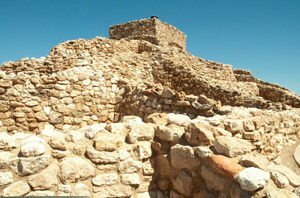 Tuzigoot was unearthed during the period from 1933 to 1935 by Louis Caywood and Edward Spicer, from the University of Arizona. In 1936, the ruins were prepared for visits by the public, for the visitors' a center and museum were built. FDR (Franklin Roosevelt) had announced the ruins as a national monument Tuzigoot, in 1939. The Sinagua tribe was engaged in farming and exchange of goods and food in the form of trade, from thousands of miles away. Nowadays, the area has conditions similar to those in the desert. But at the time the Europeans arrived in the Valley Verde at the end of the sixteenth century, they found living conditions that were radically different from today. Then the place had a climate like the tropics and there were many plants by the Sinagua, which served as food. Fertile land attracted many species of animals and birds, which also served to feed the Sinagua tribe. The only place where one can observe living conditions close to those of those times are in Tavasci, which is named after a pioneer family who took the land leased by the mining company and engaged in milk production. At this place, the family raised livestock and today this land with plenty of water, which was helped by beavers. In this area, there are many different types of birds. The area is full of birds that are black but with red wings. In the water live fish, frogs and turtles. In the mud live snails and various kinds of larvae that feed on the waste of larger animals. The area has many natural resources, ensuring better life for plants and animals that live here. In Arizona, the Tavasci area is extremely valuable, as there is plenty of water.